Grisette has become a defining element of this blog since writing my first post on the topic (What is Grisette) about a year ago. This post marked the start of seriously focusing on digging up historic sources to understand what grisette was. At that time I had been watching pro brewers around me and elsewhere in North America applying the name to wide range of beers without any real understanding of that it meant. This is because basically nobody knew what it meant with any detail. People had ideas, myself included, but at best they were all based on a couple pages of information in modern English-language sources. I don't mean to downplay the value of those sources, which focus on other beers, as they present great info. And they played a prominent role in keeping grisette alive/in the minds of brewers. 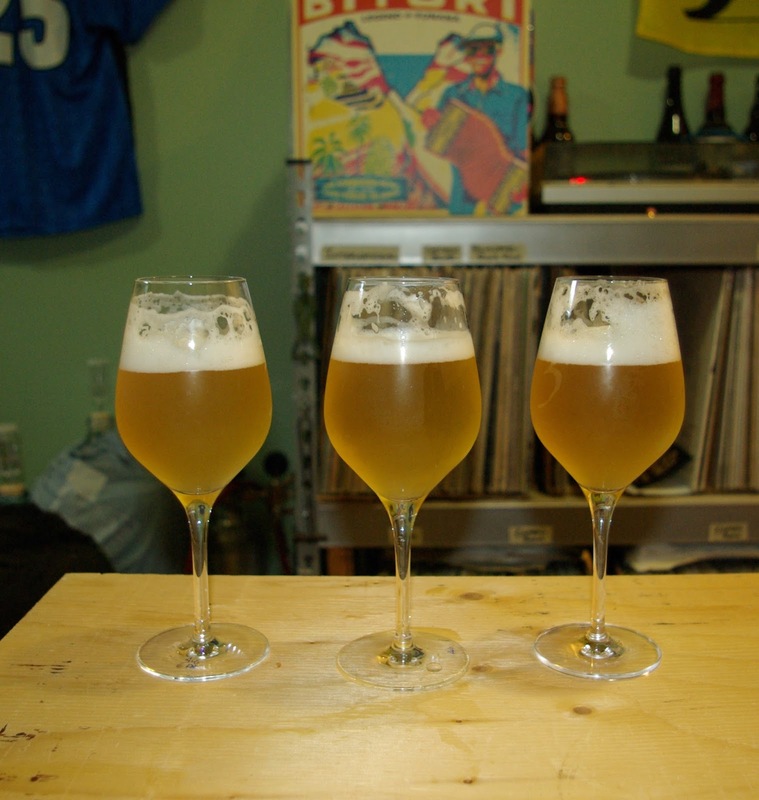 Many of us wouldn't have heard of grisette without those books and I've even talked to a European professional brewer who learned of the style through Farmhouse Ales by Markowski. But for a more full understanding, excepting the information from those who drank historic grisettes such as Leon Voisin of Brasserie Voisin as quoted in Farmhouse Ales, the information in these texts all came from historic Belgian sources that are out there somewhere. So I wanted to dig those up for more details. What it looks like when I try to organize thoughts on grisette. 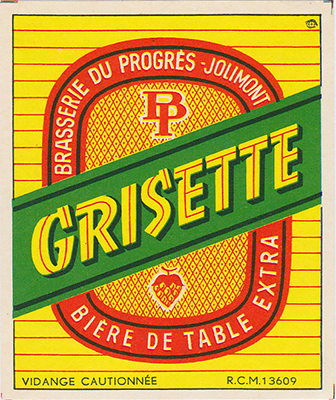 This research on grisette also took me to 1800s and 1900s Belgian primary and secondary sources on other historic beers, which has now become a main focus of this blog. I expect to move more focus in those directions and let my mental organization of thoughts on grisette slip a bit. With grisette, for blog posts and especially for presentations/interviews, I would spend a lot of time working to build the information I had into an organized structure. With a recent presentation in Vancouver and one more grisette event coming up - a podcast/radio recording - I am going through this again. And I decided I should use the opportunity to transfer the same organization to the blog. My first post on the topic was mostly an organization of what info there already was available in English, including the conflicting pieces of info, and a beginning analysis of labels. This post has by far been the blog's most successful and I think it did a good job of setting me up for what was to come with the historic sources. But the real substance of my research came in later posts and presentations. Unfortunately those posts have seen many fewer reads and not all the presentations are available to everyone, so I think some of the later work I've done to update and expand upon what grisette was may be lost to many. Similarly, the recipe I posted previously was brewed before I all of the more serious research (as was mentioned in that recipe post with some caveats). I still feel that recipe fairly accurately could produce a grisette, but I think you could also make a more "grisette-y" recipe. I gave a more grisette-focused recipe in my talks here and there including my NHC presentation, but again, this is not available to everyone. So I'd like to update that first post and recipe with the subsequent research I've done, in a more clear, concise and universally accessible way. 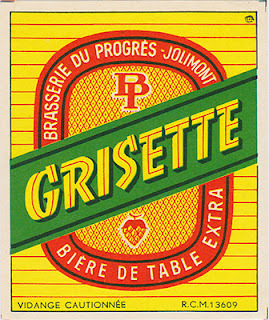 A lost grisette - label form Jacques Triffin. I expect there could be more posts on grisette to come for this blog, and I'll certainly keep looking for info on the style, but with less focus than before. This summary will serve as a brief overview of what I know now before I shift focus to other topics. Much like the previous posts, this info is built on what I have seen and extrapolating from there, so parts of this understanding may be refined/changed as I learn more. So here it is: What is Grisette, part II. This might read a little choppy as I'm trying to keep it pretty short and quick. If you are interested in more information, these other posts from the blog and recordings of interviews/presentations (below) go into the information in more detail. These will also be linked again in the rapid fire-style list of grisette characteristics below where they are relevant. Interview on the podcast Fuhmentaboudit! What: A fairly clear pale wheat beer that was a refreshing drink in the summertime. The beer was generally but not always lower strength. There were multiple classes of grisette. Ordinary grisettes were fundamentally designed to not be aged. There were aged versions of girsette that changed some of the fundamental structure to benefit aging, but in general it is not a beer for aging, both in recipe formulation and practice. Based on the hopping rates and lack of aging as well as the historical descriptions, I don't think grisette would have been an acidic beer. Some examples of certain classes from some producers may have had some, but on the whole it seems from the record, including descriptions of the beer, that grisette was not an acidic beer. Multiple texts make a point of noting that the brewers who know how to make grisette were few and didn't like to talk about how they make it, so there isn't a lot of info. Where: Grisette comes from the Hainaut province of Belgium, and specifically the earlier info I've seen comes form Scheldt and Dender river areas. Bigger cities in the Hainaut province like Charleroi and Tournai had grisette brewers at one point, as well as many smaller towns in the province. When: I believe grisette started in the 1700s. The earliest source I have seen is from 1812, which mentions a brewery that has established itself via it's grisettes. 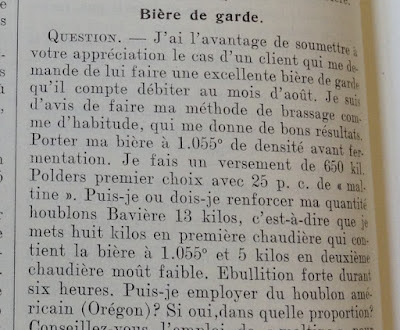 This brewery was distributing the beer, at least somewhat locally if not also exporting, suggesting: a) they weren't small, b) they had been making grisette for a while, and c) people liked to drink it. Hops: This post goes into more detail on this. Belgian (likely Belgian landrace hops, which are no longer in much production) were probably generally used. Likely coming from the Hainaut province, though possibly from Aalst or Poperinge for the bigger breweries/those who could afford these hops. Some brewers, especially those making higher classes of grisette, would also have used imported hops at times such as German (Hallertau) Czech hops (Saaz) and English hops (East Kent Goldings). Some general historic sources of the time suggest that German hops were not always thought to be the preferred choice for imported hops. On the order of 3-4 g/l for an ordinary grisette is the right sort of level. Hopping was generally balanced toward bitterness rather than flavor. With Blegian landrace hops no longer around much, I used Czech Saaz. English hops would also have been a historically accurate choice. low dose (<1 g/l) and with better quality hops. So a producer, at least one who could do so, would have favored Czech or English hops for this. Dry hopping would have been done at storage/serving temps after fermentation, probably with a reasonable contact time. Malt: Grisette was a wheat beer and the wheat was malted. I have seen no mention of grains other than wheat and barley in the historic grisette literature. I think one could possibly add some other grains to their beer, though the more those other components express themselves in the finished beer, the less closely it would follow historic grisette. The breakdown given in Pelset's 1874 text, the one source that goes into detail on the beer, is to use roughly 88% malted barley (spring 6 row) and 12% malted wheat. The wheat was more of a chitted wheat with very little germination time and the kilning temperatures were very low. Not far away from wind dried malt. Other sources mention that the barley would have been a winter 6 row. Given the nature of the beer, a spring 6 row is probably better. Yeast: In short, I have no clear answer. I think one of the terms used to describe yeast character for this beer, both by me and other sources, can be confusing - 'clean'. A clean yeast profile can refer to a more flavor-neutral yeast in Saccharomyces comparisons (something toward a lager or American ale strain compared to a more expressive yeast like many Belgian strains, especially saison yeasts). Alternatively, clean can be used to describe pure Saccharomyces beers from brett beers. Grisette wort ready for fermentation. 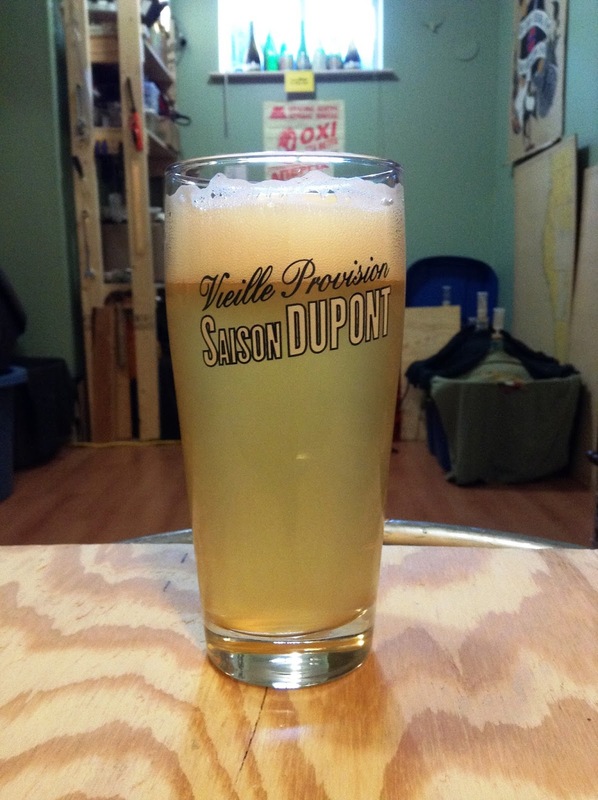 There are a couple things about grisette yeast/fermentation that I am sure of. 1) They were ales. 2) Based on this, for most of their history they would have been mixed-culture beers. 3) The average grisette was not an aged beer. Therefore this mixed culture wouldn't get a chance to express itself much. I find no clear meaning to 'clean' as it refers to grisette. They certainly would have been 'cleaner' than saisons for most of their shared history because grisette wasn't generally aged enough for the mixed culture to express itself while saison was an aged beer. So a grisette that comes across as a Saccharomyces only beer, or perhaps with just a hint of additional yeast or bacteria, is definitely cleaner than historic saison, which was a beer that often could have had a final flavor profile with quite a bit in common with lambic. So based on what I have, I think one could make a grisette with a saison yeast that is 'clean' in the sense of not having any or much expression of brett or bacteria as well as one with a yeast that is 'clean' in the sense of less Saccharomyces expression than a saison yeast. I think there is a case for both to have some accuracy/validity and I don't feel I can recommend one over the other. For my personal tastes, I'll lean toward the former generally. I'll also add these two bits that support a saison or saison-like yeast. Firstly, in Farmhouse Ales, Markowski states that oral accounts from those who drank grisette describe the beers as saison-like. And secondly, the modern Belgian (and French) brewers who know beer history use saison yeast when when they make grisettes. They make these beers rather irregularly, but De La Senne has been known to make some (including one with Thiriez). This recipe reflects historic research but it is shifted towards modern ingredients (no landrace Belgian hops, and also some grain/malt substitutions that I think are reasonable) and also slightly by my personal tastes (mostly when it comes to hopping). So it is a 'modernized' grisette recipe. I am adding more finishing hops than I think would have been used in historic grisette. I am also not using enough bittering hops, but that is probably partly balanced out by hop quality. I could post here what is listed in historic texts for recipes but they are incomplete and I haven't brewed exactly what is listed. And based on how much ingredients have changed between then and now, I'm not sure that such a recipe would have much value. Another caveat that I bring up regularly when talking about historic beers is that they are heterogeneous entities within time across different producers as well as through time. There is not one absolute answer for what a given beer was. And finally, I'm not comfortable putting a recipe up here that I haven't brewed in case it is way off when using modern ingredients. But if you really want that and enough people hassle me for it then perhaps I could be convinced to do that. So here is a recipe I think accurately reflects much of historic grisette with some small exchanges to bring it into the modern world. If one were to 'modernize' grisette, I think it would modernize in this direction. If you wanted to make this recipe more like historic grisette, you could drop the late hopping rate (or eliminate late hops altogether) and increase the bittering hops. The wheat is also higher than the ~12% listed in Pelset. Malt #47 during testing and selection at Doehnel Floor Malting. Grist: For a base I am using a locally sourced and somewhat unique malt. I'm sorry this isn't especially helpful for those looking to use the same, but here is some reasoning for why I choose it and some ideas for substitutions. I am choosing it for three main reasons: 1) it is a good malt/I like the way it tastes, 2) it is local, and 3) I think that while it is a 2 row rather than a 6 row, in certain respects it is more similar to historic malts than many modern malts. It is a feed variety, so not malting specific. It has a high amount of husk material per kernel. This is clear when chewing on the grains, but can also be noticed from holding and breaking kernels. The protein is above typical British malt levels and in the range of/on the higher end of Continental European malts. This specific malt is also a bit undermodified and has a low friability and high B-glucans. It is the same color range as a continental European pils malt. If you are looking for something unique/with these sorts of specifications, check to see if you have a local/somewhat local craft maltster. These maltsters are more likely to be using less typical grains and/or make more unique products. If you wanted to use a more major commercial malt, you could source a commercial 6 row pils from some suppliers. Otherwise a continental European 2 row pils would still be fine and make a good beer. Generally speaking we won't be getting exactly up to historic grisette on the raw ingredient end so my philosophy here is to not stress much about it and choose ingredients with intention to either make the best beer, or approach historic beer (possibly both) depending on your tastes and goals. Racking the beer onto dry hops. 79% Doehnel Floor Malting #47 - An undermodified spring 2 Row feed barley malt (variety - Austenson). 14% Malted wheat (I used N American white wheat malt, but European wheat malt might be a better choice if you have access to it). 7% Flaked wheat - these two are used to try to emulate a chitted wheat. If you have chitted wheat you can replace both wheats here with that. Dry hop (optional): 0.5 g/l Styrian Golding for ~5 days. This is quite noticeable in the finished beer and you could experiment with going lower. Mash: This is informed by the grains I am using, historic Belgian mashing in general, specific grisette mashing, and modern Belgian mashing. I don't have a specific and complete mashing profile for historic grisette at the moment. This is very thick to account for additional infusions to come. -A Belgian brewer would probably then do a high saccharification step around 162 F / 72 C or so (possibly in conjunction with a first sacch step being shorter than I did) and/or a mash out close to denaturing enzymes but probably at a low enough temp where you would still get some conversion for a bit. I leave it here and don't do a mash out. 90 minutes. Historically this could have been even longer. Probably not much shorter, and more likely longer than shorter. The fermentation potential (to use a saison yeast or not) is discussed above and I have discussed aspects of it in my interview with Basic Brewing Radio, my AHA HomebrewCon talk, and this quick interview with Basic Brewing Radio at HomebrewCon (see this FB post). Recently I have been using the Thiriez yeast, cultured from a bottle, and I like it quite a bit. Otherwise I am partial to a blend of 3711/3724 (favoring the 3724) if you want to go in more saison yeast-driven route. If you don't want to go this way, I like Wyeast 3787 fermented cool for beers of this nature. Those are just some ideas, and you should use either your favorite saison yeast or blend, or your favorite more neutral Belgian ale yeast. A head-to-head tasting of 3 different grisette homebrews. With Thiriez yeast I pitch around 68 F / 20 C and raise to 72-74 F / 22.2-23.3 C over the first 3-4 days. I let a warm primary go for 5-7 days and then I let it return to room temp (for me this is about 64-66 F / 17.8-18.9 C) for 5-6 days. If I am dry hopping I rack on to the dry hops around day 5-6 and I give about 5-6 days of contact time on the hops at room temperature. I am generally bottling at 10-14 days. I'll let bottles condition for a couple weeks before drinking them. You might find a different timeline and temperature range is best based on your yeast choice, but overall grisette is generally not a beer designed for age and something like 3-4 weeks grain to glass (at least when you start drinking it) is probably not far off what would have been done. Some grisettes were aged longer and some may have been consumed even sooner, so you can play around with this timeline a bit. But for a young/ordinary grisette I would try keep the grain to glass time pretty quick. So there's a rundown for now, balancing being quick with being thorough. I suppose now all that's left is for you to take this info and brew your own version, following more or less closely depending on your taste preferences and goals. And then drink it. Cheers! My latest batch of grisette following this recipe. De La Senne / Thiriez Birthday Session grisette. what a nice post, I'm huge fan of the Grisette, at least the idea, I haven't tryed any commercial examples but since i read about it at Markowski book I started to design my "interpretation" based on what i read and what I'd like. After i read your post i realice I was very close. it's my favorite beer to brew and drink, I think Grisette can be the perfect thirst quenching beer for summer or in my case, every time of the year because it's pretty damn hoy here in México. Cheers and thanks for checking out the blog! I think that because of the low ABV the water mineral content could be VERY important. So I'm designing an experiment, brew the same grisette with different water. I'm very curious about this style.I think you are one of the only persons who maybe can guide me, hope you can help me with this experiment. Please, feel free to answer what you want or give the recomendations you want. what do you think about the water? In the radio show you said that probably the water had relatively good mineral content. But do you think maybe the breweries treats the water? What do you looking for in a good grisette(Water content)? What recommendations or suggestions can you give me?. Finally, Saisons had a little tartness character (At least in the BJCP guidelines). Usually achived with a low PH (5.2-5.4). Do you think grisette beer have also this character? Thanks for following the blog and for your well thought-out questions! Here are some thoughts about water in a grisette. I agree that in general water can make a bit difference, and having less to hide behind could bring the water to the front a bit more. But I think there are probably also a couple different ways to end up at a similar point. From the historic perspective, a couple texts mention that the authors suspect the water of the Scheldt River was important for the style. That isn't too helpful as the river now is quite polluted so you can't look at it's water profile for info. But given the carbonate deposits in the area, I think it is likely that the river would be fairly high in alkalinity and hardness. In terms of water treatment, I would suspect that most were just pre-boiling the water. Probably as a matter of convenience (so doing this the day before the brew) because of how long it would take to heat up brewing water. But this would result in a removal of a fair amount of calcium and alkalinity. I would still expect the water to have a reasonable residual alkalinity after boiling. From considering a historical perspective and historical texts as well as from talking with brewers today, I think it is unlikely that more specific water treatment was commonplace. I tend to brew grisettes with something along the following: ~100-110 ppm Ca, 150 ppm SO42-, 80 ppm Cl-. This is probably basically what I've said in interviews as well. My surface water (at least at the time those recipes came from - in Victoria BC, Canada) was very low in everything and this profile is shaped by that. There are definitely ways to do it, but it is a bit difficult to increase alkalinity in water like that. So this is probably the strongest point in which my recipes differed from more classic grisette water. I prefer leaning toward sulfate, with the theory that this helps the hops and not worrying about body too much (I know I'll get this to the degree that I want from the yeast, the grain/mashing, and a fairly high dose of low alpha hops) though I guess my SO4:Cl is a bit lower than the profile presented in Farmhouse Ales p.154. I would be interested in brewing the beer with similar water but with a higher alkalinity. In addition to the influence this would have on mash pH, in theory this should increase the bitterness/give the perception of a coarser bitterness, which I think could work well. This bitterness impact may only be apparent in more extreme situations though. In the end, the profile I used before worked well for me before. Now I'm living somewhere where the water is much harder (Switzerland) and I think the alkalinity is higher as well (but I haven't seen numbers on that). It is clear from the carbonate that deposits on pots, etc. that there is a fair amount of residual alkalinity at least. The sulfate and chloride are both quite low though. So when/if I brew grisettes here I'll probably start with adjusting to more or less the same sulfate and chloride as I used to use, while knowing that I will start with much different Ca, Mg and alkalinity, before making other adjustments. Regarding the profile in Farmhouse Ales (I'm guessing you are looking at the one on p.154), I'm a bit suspicious of this data. Something seems wrong here to me. The total hardness is way out of line with the two things that should be contributing almost all of that (Calcium and Magnesium). So something is going on with that aspect of the profile. There are other things that can contribute to hardness but I would not expect them to be that prominent. And if they were, they would certainly leave an impact on the flavor. So I think that profile can give some good starting ideas, but I think it would be tricky to follow it in entirety based on this internal disagreement. I think your series of tests sounds like a good one. Let me know how they go! One other idea you could play around with is adjusting your profiles in the glass. This will of course ignore many places where the salts could influence the beer (like yeast health and mash pH) but it can be a useful tool for trying to dial in some more flavor-active components (like sulfate to chloride and small amounts of sodium). I've done this by dissolving salts in a small amount of water and adding a known amount to different glasses (I added plain water to my 'control' glass to make sure that the addition of the base water wasn't messing with things). This proved to be a quite informative tasting. One warning I would give is that the right amount of salt for a couple sips or for one glass of beer might not scale up linearly to a full batch (i.e., you can handle one glass of a slightly over-salted beer and not notice it too much but you'll notice it in a full batch, so you may want to lean toward more conservative numbers if you do a tasting like this). Regarding the saison tartness bit - 5.2 to 5.4 is in the normal recommended mash pH range, so I don't think this would be enough to lend a tartness to a beer on its own. In saisons this instead would have been from the activity of lactic acid bacteria. I'm not sure what the modern BJCP might be getting at if they have tartness in the description as I think they would recommend against live bacteria in the beer. At least if it is to be entered in the saison category of a competition (a saison with more acidity, in line with a light tartness-type comment, may be better served in some sort of wild category). But I haven't looked at competition guidelines in a while so I may be wrong here. And you can get away with a bit of tartness in a normal saison category as long as it isn't something people would think is properly sour. In general I think grisettes probably wouldn't have had much tartness. They were certainly less acidic than saisons historically. The appropriateness of a bit of tartness depends on the type of grisette, but the typical grisette was meant to be consumed young so it wouldn't have had a lot of time to develop acidity. I think it would be ok to brew a grisette with a little bit of tartness, but in that case it should probably be a bit stronger as well (5+ %). So overall I think the normal grisettes are better made without trying to get this sort of tartness. Cheers and thanks again for the good questions!